It's been awhile since I've seen an enjoyable space opera in the theaters. It's sad, really. To me, that's the kind of epic, sweeping story that movies are made for. Of course when I heard that James "Slither" Gunn was directing an adaptation of one of my favorite space comics from recent years, I was ecstatic. Finally, I would get the space opera that I was clamoring for. The movie is more of a comedy than an action film, perhaps in the vein of Ice Pirates. That's not a problem. I always enjoy some levity in a film and GotG is rife with it. It helps smooth out any bumps in the road and helps make the dire situations seem that much more so. When the characters you've been watching crack wise for two hours get serious, you know that the stakes are high. 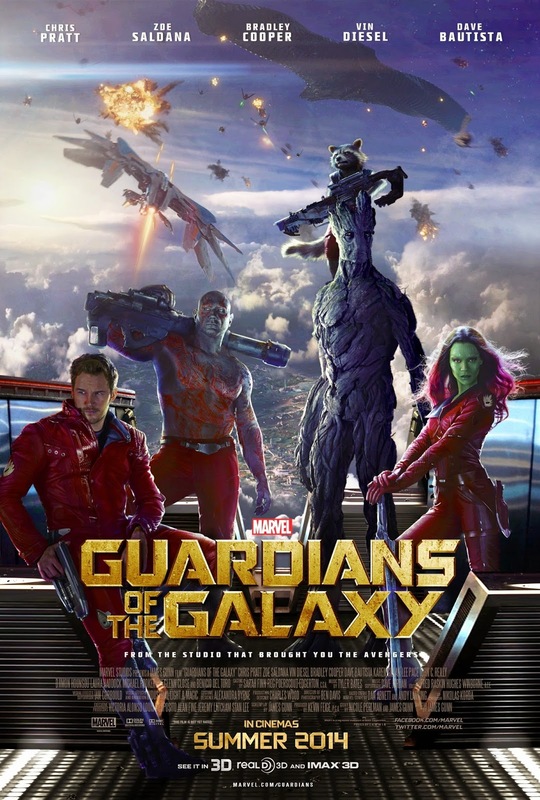 For those unfamiliar with the comic book, the current Guardians of the Galaxy is about a rag-tag team of heroes who have been drawn together for various reasons and find themselves in the unenviable position of trying to save the universe. Originally, the team was comprised of heroes sent on a suicide mission of sorts in Annihilation: Conquest. Seeing that they worked together well, Peter Quill aka Star Lord took it upon himself to keep the team together and they added a few more wayward souls and became the Guardians that we know and love. They operate out of a giant severed head of a celestial being and have a friend that is a telepathic Russian dog. Needless to say, things can get a little strange. What's great about the movie is that it embraces that strangeness. I think a lot of people were wondering if Marvel would have them whitewash the world that the Guardians work in and make it fit in with the rest of the Marvel Universe. Take a look at Thor, where they turned gods into aliens and made all of their magic into technology. Fortunately for us, James Gunn had a distinct vision that included all of the quirks that the comic gave us and he brought it to a brilliant and colorful life on the big screen. Chris Pratt is great as Star Lord. Not being familiar with his other work outside of his voice acting for The LEGO Movie, I wasn't sure how he would be in the role. He brings an easy charm to the role and his comic timing is great and easily scores some of the biggest laughs in the movie but is equally adept at bringing pathos to the character as well. The rest of the cast performs equally as well, with Bradley Cooper and Vin Diesel as the voices of Rocket Raccoon and Groot, respectively. If you told me years ago that we'd have a movie with a talking raccoon and tree in the theaters and people would be flocking to see it I would have thought you some sort of crazy prophet. They work well as a team, even though they're not actually on the screen. I could see a spinoff with just the two of them coming about in the future, easily. The cast is rounded out by Zoe Saldana as Gamora, the most dangerous woman in the galaxy who doesn't get much time to shine but does well with what she has and Dave Bautista, a giant of a man who glowers his way through the film yet brings a tenderness to the role I wasn't expecting. It looks like other people are responding well to the movie too as it garnered quite a take at the box office for its opening weekend. That's no surprise as it is a genuinely fun and interesting movie that appeals to people of all ages. I took my parents with me and they loved it, which is surprising in part because my mom doesn't really like sci-fi. Guardians of the Galaxy is easily the best film I've seen after Godzilla this year and I can't wait to see it again. It also boasts the best soundtrack I've heard in a long time, with songs that actually make sense in the context of the movie and not just thrown in there to sell records to kids after the fact. If you like space operas, you'll like this movie.